One year has passed since the Dollars - the largest and most well known organization in Ikebukuro - assembled en mass to stop Namie Nagiri’s ambitions. Their secret leader, Mikado Ryuugamine, continues to watch from the sidelines, attending school with his friends Masaomi Kida and Anri Sonohara. While Anri is thankful for her newfound friends, she has problems of her own when a teacher begins making creepy advances. At the same time, Ikebukuro’s most notorious legend, the Black Rider also known as the dullahan Celty, is attacked while on a courier job by a serial slasher who has begun terrorizing the area. Meanwhile, an intrepid newspaper reporter attempts to find out who the most powerful person in Ikebukuro is, eventually putting him on the trail of the explosive Shizuo Heiwajima as the mystery of the slasher grows deeper. Interweaving the stories of this strange group of characters into a delightfully off-beat tale, Durarara!! Vol. 2 improves significantly on the first volume, captivating me at every turn. Narrowing the focus considerably in terms of characters, Vol. 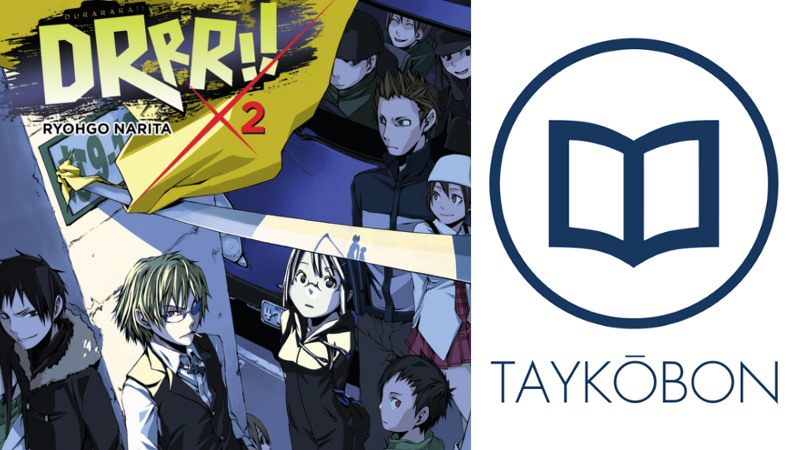 2 focuses on primarily on the stories of Anri, Shizuo and Celty as they are affected by the serial slasher terrorizing Ikebukuro, becoming a fascinating crime thriller. I thoroughly enjoyed the sense of mystery created both through the memorably structured prose which often jumped between viewpoints of characters rapidly creating a vibrant sense of a city full of rumours as events happen. It was fascinating to follow along and try to figure out the mystery alongside these characters as each only knew a portion of what was really going on as they attempt to get to the bottom of the mystery. While the ending of the book got a tad bit vague to the point I had to re-read the last chapter a couple times to full put it together, the story is wonderfully satisfying and kept me fully engaged the entire way through. The focus on fewer characters did wonders, and I really enjoyed how this allowed for a deeper character arc for each of them to be explored. Both Anri and Shizuo were side characters in the first volume, but here they are the main focus of the plot as their own doubts and fears are explored. The characters introduced in the first volume are still present, but they are viewed through the lens of different characters. A fantastic chapter early in the book follows a newspaper reporter out seeking opinions on the strongest person in Ikebukuro, running into many of the strange characters which populate this series in the process. This chapter impressively grounded many of the characters, reinforcing where everyone fit within the context of the overall story while simultaneous providing an interesting window into what many of the characters actually think of each other. I thought this was quite cleverly done and really paid off in terms of providing characterization for this wide cast even if they were off-stage for the majority of the book. Shizuo’s arc in particular was engrossing, and author Ryohgo Narita makes full and incredibly effective use of alternating perspectives to create a compelling image of Shizuo. By first introducing Shizuo through the perspectives of numerous other characters before finally using him as a point of view character, Narita creates a powerful contrast between his image and reality, using this to tease out an impressive degree of depth. I thoroughly enjoyed the way his character just oozes personality, and Narita does a great job characterizing him as an unpredicatable wild-card in all of this. Similarly, Anri receives a high-degree of characterization as her insecurities are explored at length. This was especially interesting because of the contrast between the outside impressions of her we witnessed through main protagonist Mikado Ryuugamine in the previous volume and her actual self-perception. Both Anri and Shizuo’s stories intersect in the finale of this volume, wrapping up the mystery as well as their character arcs in an impressively satisfying way that provided a tantalizing set-up for the next volume. Continuing one of the most notable aspects of the first volume, this volume makes skillful use of dynamic variations of its prose to create a palpable sense of atmosphere. Written primarily in the third-person, the narration changes to first-person in the chapter mentioned above following the reporter, conveying the vague and fluid nature of the rumours that he encounters. This also provided an interesting perspective on many of the characters, giving the reader a closer and more personally affective viewpoint. Additionally, the chatroom conversations used in the first volume make a return here, fitting in well in creating a real sense of mystery, providing a compelling punctuation point to each chapter. While I won’t spoil exactly how they are used, I really enjoyed the dynamic page layouts used in several sequences, giving the slasher a distinctive mystery about them. It also bears mentioning that this volume is superbly translated, with the difference in narrative flow depending on the character being followed conveyed extremely well. This is one of the best translated light novels I’ve read so far, and translator Stephen Paul deserves kudos for an exceptional job here. Durarara!! Vol. 2 was a fantastic read, leaving me wishing I could dive into the next volume right away. Building upon the setting from the first volume, this volume skillfully narrows its focus to follow Anri and Shizuo, interweaving their own character arcs with a entertaining mystery as they try to track down the serial slasher. The series’ distinctive weirdness shines through yet again, creating an entertainingly off beat narrative which is definitely worth your time. Durarara!! Vol. 2 was published by Yen Press on November 17th 2015. Authored by Ryohgo Narita and illustrated by Suzuhito Yasuda, the series is currently ongoing and published by ASCII Mediaworks’ Dengeki Bunko imprint. First published in Japan on April 25th, 2004, the series was completed in 2014 with 13 volumes, with volume 3 scheduled to be published in English on March 22nd, 2016.